All bags will be checked before entry and ID required for credit card use. Styrofoam cups are prohibited, and only water is permitted in the facility. Pools will close for the season on Aug. 12. 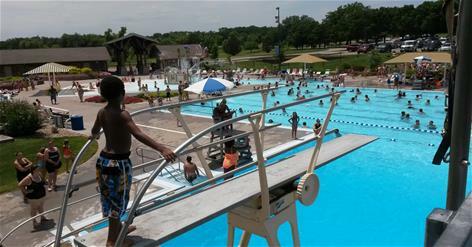 Midwest Health Aquatic Center will remain open on weekends until Labor Day. Join your friends and walk against the current for a great low-impact aerobic workout. Time: Mon.-Thur. ; Sat. 8 a.m.-11:30 a.m. This unique style of aerobics combines the great cardio exercise of step aerobics with the low impact of water. Feel the burn! Available for purchase at Administration Annex, Shawnee North Community Center or any aquatic facility. *Rent facility for church groups, family reunions, staff parties *Outside food & drink is welcome *Must be 18+ to register. June-Aug. Fri.-Sun. *Air conditioned party room *Includes 12 admission wristbands, additional bands are $3 each *Outside food & drink is welcome but must stay in party room * 18+ to register. *Rent facility for church groups, family reunions, staff parties *Outside food & drink is welcome, must stay in party area *18+ to register June-Aug. Fri.-Sun. *Open air area *Rental includes 12 admission wristbands, additional bands are $4 each *Outside food is welcome. *18+ to register.